Sorry. Didn't see any previous reference to the book. A comment about the "sick pink color" above: Our daughter hated that friends/family would automatically buy her pink stuff for the longest time when she was younger, and is only just now at the age of 14 considering it "OK" in small doses on her clothes, etc. She also refused to play with Barbies and never asked for one because, (in her own words) "everyone thinks I should". LOL! Consider yourself lucky. A lot of teens have little or no interest in doing or learning anything that requires a bit of effort. Chances are your daughter will find something that she wants to pursue, and anything she has learned from her earlier pursuits will be of value. Migosh, what a project! Great video, but my head is still spinning. And all for watching a cat?!! Well, yeah, anybody got a problem with that? Good grief. Wow! That is extreme. 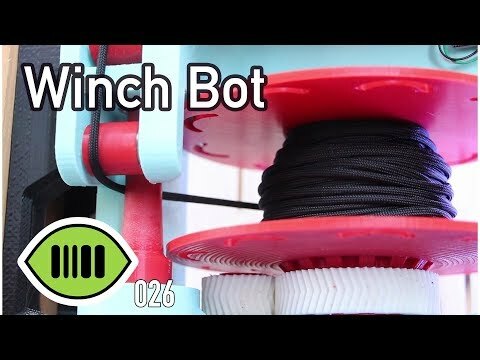 I don't know about cat cam, but the winch bot could have a ton of other uses people might be interested in. What an amazing project and builder! I'm with Phil, my head is still spinning! things as panoramas. There are Pings on it for autonomous roaming but that would not be used in a crowded area. my hubby from having to carry all his camera equipment around all day at events such as Robothon. What a great wife! My wife must not love me, she never made me a robot! She did way better, she made twin princesses! Yes, same here. I have to speak to 'er in doors about that. You are in a class by yourself! 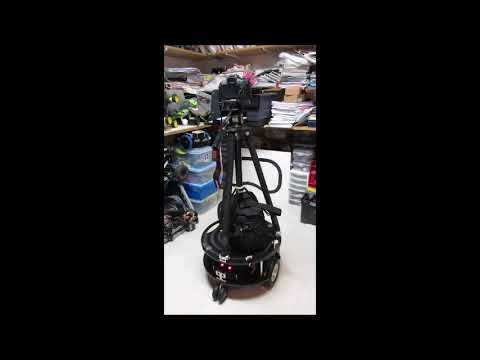 To the thread topic - I know that you are an inspiration to many young (and old) roboticists! The fields of engineering, programming, and robotics need more folks inviting others into the fun! Thanks for all you do! My wife must not love me, she never made me a robot! Your wife deserves sainthood for eBay tolerance alone! Seems a lot of SLA printer use is either for teeth (ugh) or custom jewelry. The custom jewelry thing is very interesting. You print in plastic and then pack in stuff and then put in oven and plastic burns away leaving a void that you fill with precious metal. Seems it's been done that way for years, but now you can 3D print custom rings stuff. A lot more girls sign up for our 3D Printing classes than Robotics, typically. I thought a 3D printer was a robot. So I guess the question is if I tell these girls that the 3D Printer is a robot, will I get more girls in Robotics or fewer girls in 3D Printing? Don't mention the R word, just keep them knee deep in pink glittery plastic. ...just keep them knee deep in pink glittery plastic. You know, perhaps maybe, just maybe, such remarks are why women don't want to work with the guys in the technology space. As I'm reading about all the time now a days. It's a bit of a put down, don't you think? And certainly painting all females with the same brush. It's seems such a trivial thing, most girls I know would brush it off and move on. Well, apart from the ones that would tip your beer over your head and give you a severe shouting down. It must get a bit tiring though. Personally, I would think any negative comments regarding the use of pink with regards to females would be a bit offensive. Every time I see any event regarding breast cancer or women cancer awareness it is always associated with the color pink. Heck, even the NFL goes through a women cancer awareness period where they wear some aspect of their uniform in pink. However, my own daughter, after she could make clothing choices herself, tossed any article of clothing that had the slightest amount of pink on it. But, the lack of following the status quo regarding how girls dressed got her much ridicule from the other students at school which even followed her into college. This ridicule was primarily by the other female students. While at the local community college when my daughter was trying to follow an Engineering path, mostly pushed by my wife, my daughter signed up for the Robot Club on campus. She and I used to enjoy watching the British Robot Wars show and I even bought "her" a Lego Mindstorms (RCX Yellow Brick version) which she seemed to enjoy. I may have had a BASIC Stamp at the time and I do know I have a BASIC Stamp Programming book circa 1998. But, eventually she got tired of being used as a selling point for the school as the only female in the club as well as being hit on by every dude in the club since, yeah, she was the only female. She eventually went on to be a Film and Digital Media major focusing on sound; another male dominated business. Funny thing for her is that if the Robot Club was all Female, she would have avoided it completely. Perhaps someone has done a study on the question that is listed in the title of this thread. It would be interesting to see the responses of a sample of female students as to why they did not go the Robotics path. It would also be interesting to see a statistic regarding the number of kids who partake in the Parallax courses and go on to study Engineering at University and especially graduate and get a job in their major. Maybe even break that down by gender, but to be PC it might be best to be gender neutral. Yeah, I can get a bit long winded. I'm going by my own experience with 8-year old girl twins, that they like pink. Also their older friends. And their moms. Oh, and several billion dollars of Barbie focus research confirms it. They have it down to a specific shade, hue, and brightness of pink that girls like. Pantone 219C. For every little girl that hates pink, there are 219 that do. It's in the genes. No shame in it. It's that kind of talk that got James Damore fired from Google. I found myself pondering the growth of the pink phenomena today. As epitomized by the piles of random violence inducing fluorescent purply-pink you find in the girls department of Toys'R'Us. You see, when I was a kid in the 1960's our neighboring family and good friends had four daughters. I don't recall a bias toward pink with those girls. Similarly for other female friends at the time. In primary and secondary school there were boys and girls. Despite the fact that they did cookery whilst we did metal work I don't recall any pink around either. I don't recall toy stores having walls of gut wrenching pink for girls when I was a kid either. And as life goes on I can't think of any woman I have got to know that has any pink around. By the way, 'er indoors favorite colour is blue. I conclude, it's not in the genes at all. It is learned at some point. Soaked up as a cultural norm. I have no doubt that advertising research can prove all kind of things. Like smoking is not harmful. And perhaps young girls do have a pink bias now a days. I'm open to the idea that the pink bias is also programmed into them from a young age by...the advertising industry. As I said "Where did it all start?" Oh, the reason I was thinking about this today is: Lego bricks. Seems impossible to buy a "classic" box of Lego bricks without pink bricks in there. Not only that, all the outer colors have been "feminized" into pastel shades. Gak. What happened to the good old primary colour bricks? Hmm....this is odd....among my very favourite food is shrimps, prawns and lobster. Which are served up pink! Here is a nice article pointing out that the blue for boys and pink for girls thing was not always so. In fact it has been the reverse in the past. There have been all kind different "favorite colors for genders" ideas along the way. "As for why today's strict color-gender norms set in at all, Philip Cohen, a sociologist also at the University of Maryland, thinks they are, essentially, the outcome of a marketing ploy." Girls can do anything they want. Join Barbie, Chelsea, and her puppy Honey as they swim through rainbow rivers with beautiful mermaids and fly through cotton candy clouds with fairies. Facing different trials along the way, Barbie reminds her to believe in magic and helps her realize that if she stays true to herself, she has nothing to be nervous about and can conquer any challenge! Meanwhile, Ken has the Force with him. All the ones I know do.